Rafael Nadal is now just one match win from taking back the overall No. 1 ranking from Novak Djokovic. Nadal moved into that position earlier today after a 2-6, 6-4, 6-1 comeback win over Fabio Fognini. At one point against the Italian, Nadal was down 6-2, 4-1 before Fab realized what was happening and predictably faded losing 11 of the last 12 games. Up next will be the dangerous Tomas Berdych who knocked out big John Isner in straight sets. Nadal has won 14 straight over the Czech (he leads 15-3) but in a lower profile event and with the advantageous court surface I give Berdych a real shot here. Part of me wonders if Nadal really wants to play Djokovic again here. A loss to Berdych would end the streak (now at 29 straight on hardcourts) and ease up the pressure as we head toward the finish. And Rafa will get the No. 1 ranking anyway, that’s really not a concern. More importantly he’d avoid another grinding hardcourt match with Novak – those really can’t do his knees much good with so much tennis still to play this year per his schedule. So maybe Nadal falters here saving the Novak match for Shanghai. Just a hunch. In the other semi, Djokovic will face Richard Gasquet. Novak trounced Sam Querrey 6-1, 6-2 to win his 17th straight match in Beijing while Gasquet continued his nice run of late beating the struggling David Ferrer 6-3, 6-4. “He’s No. 4 in the world so it’s a big victory for me,” said Gasquet. “I beat him at the US Open, but I had lost to him eight times, so it was a very tough match. But I was more confident after winning against him in New York. Also at the event, in the women’s draw Serena Williams continues to hand out beatings this one on Caroline Wozniacki. Serena will play Radwanksa in the semis tonight with Kvitova-Jankovic in the other. In Tokyo, the semis are set with Juan Martin Del Potro vs. Nicolas Almagro and Milos Raonic vs. Ivan Dodig. Del Potro needed three sets to fight off Alexandr Dolgopolov. I’m looking forward to a potential Delpo-Raonic final and it should happen. How Rafa scraped his left knee. Nasty! Hope he’s OK.
Geez Rafa. Please be OK for tomorrow. Hope he didn’t break it! He has said that it was a bad hit, but he felt better as the match advanced, and he hopes to be ok for tomorrow, with the ice and some treatment (hehe…). He beat Berdych on Cinci semifinal. Nadal has said that in Beijing surface, the balls are heavier than there. Im not overly concerned about Berdych,the no 1 ranking,or him winning this title,i just hope theres no damage to that knee of his. Raonic is playing fantastic … but Dodig was playing lights out the other night against Nieminen. Raonic has faced Dodig three times and lost in all three .. so I wouldn’t call it a slam dunk to see him make it to the final against Del Potro. It would be great though because I think if Raonic get through to the finals in Japan he will have a very good chance of making the top 9 and going to London for the Barclay’s Tournament. He may still make it with a great performance in Shanghai but it will be much more difficult given he would drop some points by not repeating as finalist in Japan. Nadal is back at #1! Pity the match had to end early with the retirement. Its time again for some experts/past greats to restart the GOAT debate. Tough time for the sheep fans. The real number 1 is Back. Vamos, Rafa for another title! Rafa nº 1, it seems that a long streak of weeks is starting… good health! 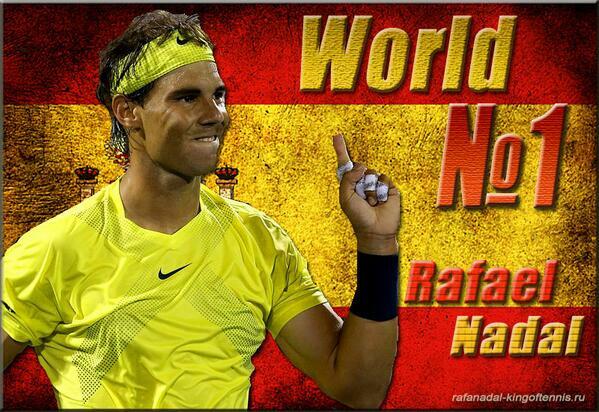 CONGRATS rafa for the feat….keep going. hope ur knees r not making any weird noises so far….do keep an ear on that though. Just got up to go to work,and saw that Berdych had retired 4/2 down,Rafas makes another final,only three losses this year,going for his 11 title this year,and he reclaims the number 1 ranking,wow after what happened last year i dont think many would have predicted that,to tell the truth im not overly concerned if he were to loose the final tomorrow against most likely Nole now. Perfect Fan lol i actually hate that song,but on this occasion i,ll make an exception. Congrats to Rafa for getting the number 1 ranking. He earned it, and earned it through dominance on a surface he doesn’t particularly like. One of the greatest comeback seasons, and possibly the greatest. However, the true test begins now. The reign of the king is as important as the king himself. How long and how well will he reign the dominion of tennis ? We will see. Hoping that Nole gets fired up and gets his own renaissance season in 2014. Vamos Champ! Back at the top of the tree. VAMOS RAFA NO 1 !! I am soooooo happy now. IMHO, I think Rafa doesn’t usually make that sort of things; Novak and Fed yes, mainly on clay and against Rafa. Tomorrow in the final, no pressure for Rafa so he will likely win .And the way he played so far-he is favourite. oh, and I forgot-Giles, just for you: VAMOS! @ Patson: You and me hope together that Novak will re-boot to version 2.0. (or at least version3.0 )in 2014. Congrats to Rafa, An amazing run! Eek! Meant that in a good way, but not how it turned out! @ Margot: I got it!Not bad…maybe-Beatles; Get back ( to number 1? ) where I belong…? Ok, I think I’ll stop now. We can only watch from the side lines Rafas success-I’m waiting to Novak bounce back and you are waiting for Andy to come back. The Alchemist by the courts. The Cyborg annihilator of players. Nitesh, u r talking like a true Fed fan. All Indian people seem to be obsessed with Fed. as u rightly said, the upcoming AO ’14 is going to be real thriller….the top 3 can beat each other on their day….outsiders like delpo, berdych, ferrer can all put together a good show. even being a fed fan, I’ll not shy away to admit that it will be a big challenge for him to even reach the last 4 or 8….unless he surprises me by winning a couple of big ones this fall. now, my point is that I feel novak’s perf will all but boil down to his AO defence. if he does that, I really feel it will do a world of good to his chances for the rest of the year….but if not so, I doubt he may have a miserable year. I feel its probably going to be andy’s year (like a 2+ slams year). It may be a 2-2 split b/n andy & rafa or I won’t be surprised….if andy takes 3. with his injured back behind him now plus being already a multi slam winner guy, his confidence mus’ be sky high….all but said, JMO !! Courbon IMO Nole has looked very good this week,and Rafa has looked rather rusty,but thanks and im happy hes back at number 1,for how long i dont know?as for Nole some of the pressure will be be off him now,been top can be a burden sometimes,but hes handled it pretty well,im looking forward to the AO to see what it brings,Nole is always the man to beat there,so it will be exciting to see if Andy or Rafa,or Roger can spring a surprise. Can anybody have imagined that Rafa in such a short span would challenge the No.1 ranking of Novak ? He has done the incredible and he is now the new World No.1 deservingly. I think he will solidify this position atleast till the start of the next clay court season since he skipped both the World Tour Finals and Australian open last year where Novak won. So, Novak has much to lose than gain during the rest of the year and he may not be in a position to challenge Rafa. With Andy too recuperating after the surgery and only likely to return next year, Rafa will go unchallenged. As regards the finals, again the edge will be with Rafa since he has beaten Novak consecutively. But since it is best of three, you can never be sure. Moreover, the court looks much faster and I do not know who will hold the advantage ? The silver lining for Novak is that in his rivalry with Rafa, the winning streak always take turns and the momentum shifts alternately. Novak may be hoping for that badly to turn it head on starting with the China Open. Nevertheless, it would be an interesting final. Alison….I believe all top guys wud like to have a good end to this season….to build up points for a great upcoming season….even rafa knows its importance, so he is taking a chance by playin as many tourneys….being in such a prime condition. same applies to nole and even roger (if he can repeat what he did in 2011….but odds r not looking good for him). Perfect Fan,call it just a hunch,female intuition,whatever?but i have a feeling Roger is gonna pull off a surprise at some point,and eek out another GS,just a gut instinct. @ Giles: Thank you Giles.So you seen my post about goat? I have to chase him away because they have a nasty habit to jump on the top of the cars…Its all good now.I gave him a carrot yesterday over the wall. But seriously-how great is to be Rafas fan right now? @ Hippy Chic; I have not watch this tournament so I don’t know in what form are those two.We will see if Novak gets through Richard first. thanx for ur thoughts abt roger….though I feel, it’ll be too tough(not impossible) for roger to bag another GS….but i’ll certainly go crazy and i’ll like leave my gf and spend my entire life a loner….if roger make it!! @courbon: Loved your Windows comment on Nole. @ Patson: Thanx.Well, Novak is in the final-lets see whats happen tomorrow. I don’t ever see Rafa or Novak not giving their best just to avoid playing each other. It’s not in their genes. They wouldn’t have become that good if they are afraid of playing someone in particular. @ Perfect fan: He needs to forget that he is Roger Federer and start playing a tennis that he is capable of.Like you said-change the game, start from beginning…If Tommy Has is doing so well-surely Roger can do better?Maybe not GS, but for time being even 1000 Master would be nice for him.. Perfect Fan i agree with Courbon,he needs to forget hes Roger Federer and all his previous success(easier said than done i know),and change his game,hes still capable of playing amazing tennis,im not just saying it either just to be kind,but i really have a feeling,that he will eek out another GS with a little luck. Alex well said,i dont either. first, I want to say that Novak is a great champion, and Rafa’s biggest challenge. Maybe more a tactic issue than frighten, if it’s true. Or keeping the body healthy. It’s true that my statement could be false, and we shouldn’t accept it without considerating it; but the fact that Novak lose to Rafa in RG doesn’ t prove nothing. There were Nole’s fans in this blog approving this assumed tactic. Gonzalowski yeah exactly,sensible fans simply live in the real world,anyway thanks for the heads up about my monikor Lalaland i presume you mean right?my late mother used to say that to me when i was a little girl at bedtime,off to Lalaland,couldnt think of anything else.